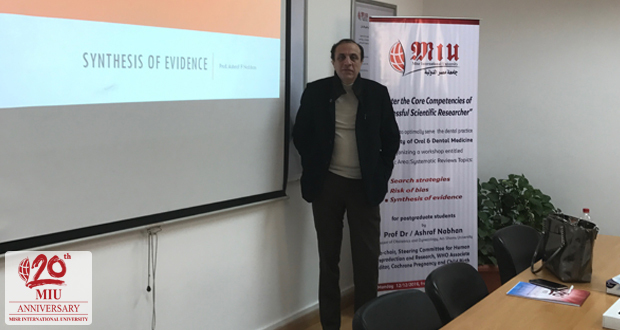 The MIU Faculty of Oral and Dental Medicine organized a workshop for post-graduate students on Monday December 19 to help them master the fundamentals of search strategies, risk of bias and synthesis of evidence in order to conduct high quality systematic reviews. 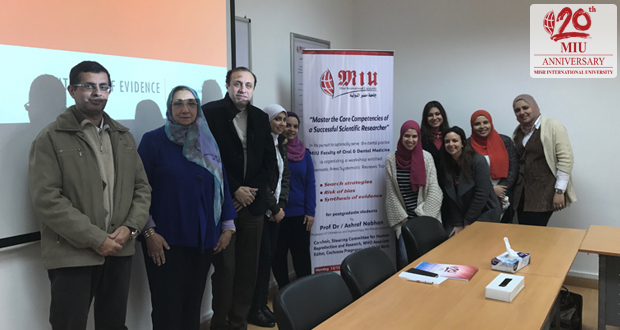 The workshop was the second in a series of workshops entitled “Master the core competencies of a successful scientific researcher”. The educational event was led by Prof. Dr. Ashraf Nabhan, Professor in the Department of Obstetrics and Gynecology, Ain Shams University.Professor Nabhan is Vice Chairman, Regional Research Committee for Africa and Eastern Mediterranean, HRP Alliance, WHO Associate Editor, Cochrane Pregnancy and Childbirth.